Tristan da Cunha hosts just 85 or so native flowering plant or fern species, but almost half of those, about 37, are found nowhere else in the world. On this Botany page we will catalogue the Tristan da Cunha Islands' land plants. It is 'work in progress' that we hope will build into a useful data base for those interested in the flora of the islands. Remoteness and isolation make it difficult for plants to colonise islands. Those that do often have particular adaptations which enable long-distance dispersal. However if colonists become established in ancient times they will often develop into new species better able and adapted to thrive in local habitats and conditions. So it is the case with Tristan da Cunha. Here there are just 85 or so native flowering plant or fern species, but almost half of those, about 37, are found nowhere else in the world and are ‘endemic’. To put this into context; the UK has 1,600 native species but only eight endemic species (and many of these are debatable). So the international importance of Tristan’s flora is completely disproportionate to its size. Consequently its conservation is very important. 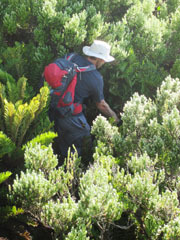 Many botanists have visited the islands over the last two centuries, but none has ever attempted a systematic survey of the island’s vegetation that gets into every part of the island and records all native and non-native flowering plant and fern species - precisely the aim of this project. The only native tree and endemic to the Tristan da Cunha Islands. Can grow to 7-8 metres, but usually shorter in exposed sites. Forms dense thickets as seen in the photo left by Jim McKintosh showing Lourens Malan cutting a path through a dense thicket of Island Trees on Tristan. Right: close up of the attractive native tree. Cut for firewood by Islanders so absent from the north-west sector of Tristan but making a come-back and is seen more extensively on Settlement Plain cliffs now. Tussock Grass dominated lower ground on all the islands but was removed on the Tristan Settlement Plains often by burning to create land for housing, grazing and crops. Also found on St Helena, Amsterdam and St Paul Island. Forming large clumps or 'tussocks', the abrasive grass can grow to 2.5 metres high and its stout stems, 5-10 mm wide give a bamboo appearance. Tussock decomposes to form a rich peat soil and offers a perfect cover for colonies of Northern Rockhopper Penguins. Tussock Grass is the dominate vegetation on Nightingale Island where it makes movement away from the paths or 'roads' very slow and difficult. Photo above from Katrine Herian above shows Julian Repetto and George Swain clearing a narrow access path through the Nightingale tussock. 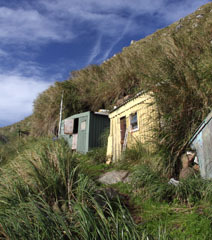 Photo right from Otto Whitehead shows modern Nightingale huts surrounded by tussock grass. 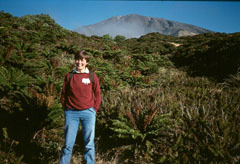 Endemic and widespread fern found on the four main islands. Distinctive cycad-like fern with stems up to 1.6m tall and 30cm in diameter. Dominates the lower base up to 800m at Tristan and 500m at Gough. Photo above from Geoffroy Hienard shows a scene on The Base near Burntwood with low stands of Bog Fern with grass patches ideal as nesting sites for Atlantic Yellow-Nosed Albatross. Photo right shows taller fern bushes on the lower base in a sheltered hollow east of Hottentot Gulch. 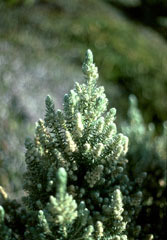 Endemic woody dwarf shrub which can grow to 80cm high but is found more widely in a prostrate form on higher slopes where it is found widely on Tristan up to 1900 metres high where it is known as 'Peak Berry'. 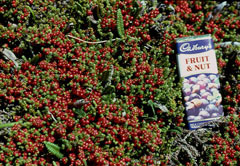 These berries tend to be larger and more brightly coloured than species found at lower altitudes at Tristan and on other islands. 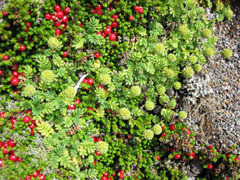 Other Empetrum rubrum known as Berry Bush or Island Berry occur on all four main islands and in the Falklands. The berries make a splendid pie for those fit and patient enough to pick them! a dwarf shrub growing from 10-40 cm high with small reddish flowers and a fruit with re curved barbs that readily attach to animals and people which aids their dispersal. 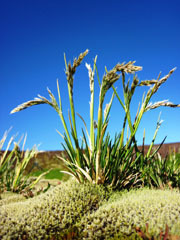 Found on Tristan, Inaccessible and Gough above 500 m.
Endemic tufted perennial grass usually growing to only 10 cm high and abundant on the four main islands up to about 1500 metres. 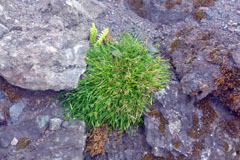 The small, turf-like cushions are able to grow on exposed rocks and were one of the first plants to re-colonise the 1961 lava flow. Photo from Katrine Herian shows a plant in the Tristan Museum 'Living Walls' Garden designed to highlight endemic plants near the village. A tufted perennial grass endemic to Tristan and Inaccessible, growing to 50 cm high and found on Tristan 650 - 1800 metres high often within fern bush, but more commonly on higher slopes. Tiny plant (despite apparently large image) with dark green leaves and a single flowerhead on a 5-10 cm stalk. Occurs in wet, boggy areas and as an epiphyte on the stems of Bog Ferns. Occurs on Tristan, Inaccessible and Gough, also South America and the Falkland Islands. We will endeavour to build up a more comprehensive spies list in the future. Those images not otherwise credited are from Richard Grundy.